When my grandma calls me on the phone, she always asks, “How are your studies?” Her use of the word ‘studies’ rather than homework has always made me daydream of the days when mad scientists and scholars sat in libraries lit by candlelight, itching to discover some mathematical theories. There’s something different about the previous generations’ attitude towards intellect, that it is a privilege to gain and a mystery to engage. In Donald Margulie's play, “Collected Stories,” he constructs an elderly woman fascinated by the written word. Interestingly, the woman lives in present day, and he climaxes his play in New York, with an intellectual discussion at the 92nd Street YMCA. Many New York old-timers reference the 92ndStreet Y as an appreciated resource for learning even today. I know of a woman named Lil who sells her drawings outside the facility each day, and she’s dying to tell her customers about the artistic culture they facilitate. She remembers singing on the stage there in her twenties and feeling truly appreciated, a rare feat. While many people aren’t aware of the Y’s existence, it’s an old New York staple that continues to promote craft for the sake of craft, not the products it can produce. Some notable people will be appearing in the Y’s lecture series over the coming season. On October 4th, Julianne Moore will be conversing with Leonard Lopate on her identity as a mother and her new children’s book. Supreme Court Judge John Paul Stevens will give a speech on October 9th. Paula Deen is scheduled to speak on her childhood in Georgia on October 11th. On the 13th of October, Caroline Kennedy will discuss her new book, Jacqueline Kennedy: Historic Conversations on Life with John F. Kennedy. October 19th is sure to please, as funny man from the New Yorker, Andy Burowitz will be analyzing American comedic writing theory with Alec Baldwin. Malcom Gladwell will grace the stage on November 1st. The creator of “the Office,” Ricky Gervais will be interviewed on November 13th, followed by Michael Moore in the same conversational style on the 15th. These are only a few of the many individuals scheduled to speak at the Y this fall. Having personally attended some lectures, I can attest that the series at the Y feel more like educational opportunities rather than awe-inducing shows of the teacher’s talent. There is usually an audience Q&A time with the speakers, and most of the time, a book signing or meet and greet follows the session. Tickets to the YMCA lectures are in the thirty-dollar range, but the hands-on interactive approach makes the price worth every penny. In New York, compelling and enlightening events take place all the time, many times under wraps. 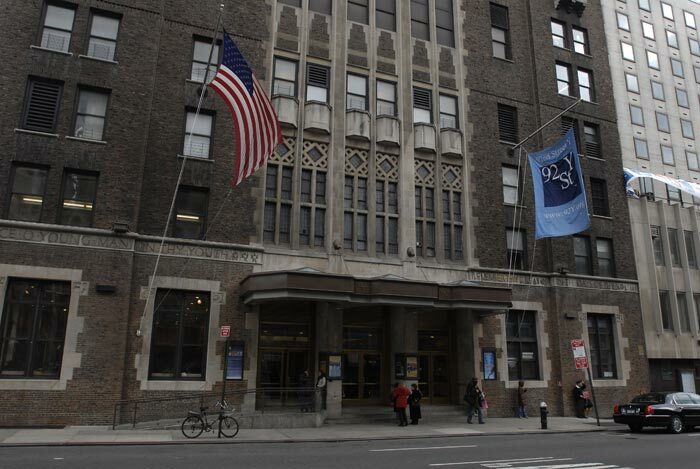 Since it’s founding in 1874, the 92nd Street Y has fit this description perfectly. The education presented at this venue is for enrichment rather than entertainment, enriching audiences with values like that of Lil and my grandmother. Moreover, the attempt of these lectures is more than just a furthering of old scholarly attitudes; it is an ignition of these values within our current culture. While the mentality is old, the speakers are new. Rather than reducing our generation to lazy Internet whores, the Y is nurturing our current creators, contesting that we are worth the study as well.